One of the coolest areas in London is Whitechapel, right in the heart of the East end. Here are some of my tips for things to do in Whitechapel. You wouldn’t know it from visiting Whitechapel these days, but this used to be one of the dodgiest parts of London. Go back in time just a few decades and Whitechapel was the heart of the East End of London, once known for poverty and unsavoury behaviour. These were the streets where Jack the Ripper stalked his victims. It was where low-class workers found employment on the nearby docks and factories. It was where immigrants, arriving in England with almost nothing, made their new homes. But now? Well, Whitechapel these days still has reminders of those days (and I’ll mention them shortly), but this part of the East End has become the domain of the cool Londoners. 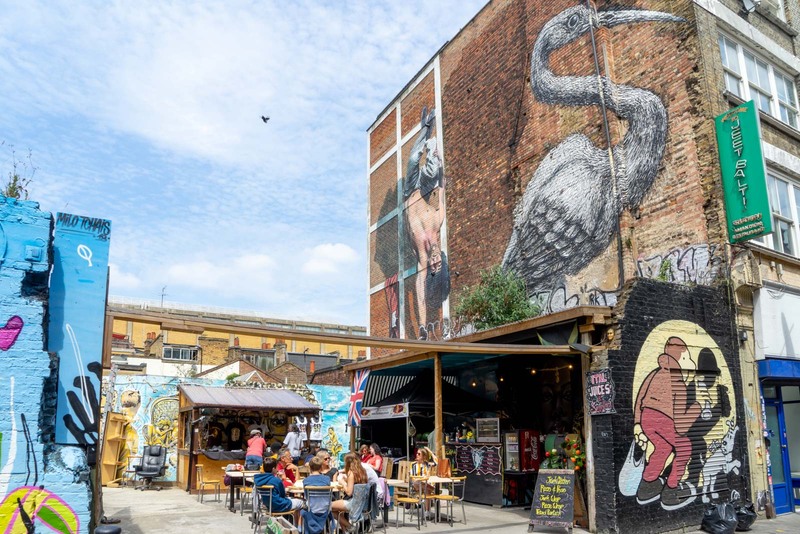 When you’re thinking about the things to do in Whitechapel, it’s all about the street art, the trendy cafes, the hip bars, and the vintage shops. You see, the ‘poor’ workers and the ‘poor’ immigrants have been joined by the ‘poor’ artists. And it’s this wonderful mix of cultures and creativity that has made Whitechapel one of the best parts of London. I’m in London this time for a project with wombat’s hostels – and they’re based just on the edge of Whitechapel. The hostel itself is fantastic, with comfortable rooms and friendly staff. It’s also got one of the best bars you’ll find at a hostel in Europe, spread out over a huge area on the bottom floor, with a courtyard, games tables, and cheap drinks. But it’s the location I want to focus on right now, because the wombat’s hostel in London is in a perfect position to discover all the best things to do in Whitechapel. With just a short walk, you’re in the centre of all the action. I’ve put together a list of Whitechapel things to see and do, to help with your planning. You can use the map below to find out where they’re all located. Now, even if you’re not staying at the wombat’s hostel in London, I hope you find this list of things to do in Whitechapel useful. 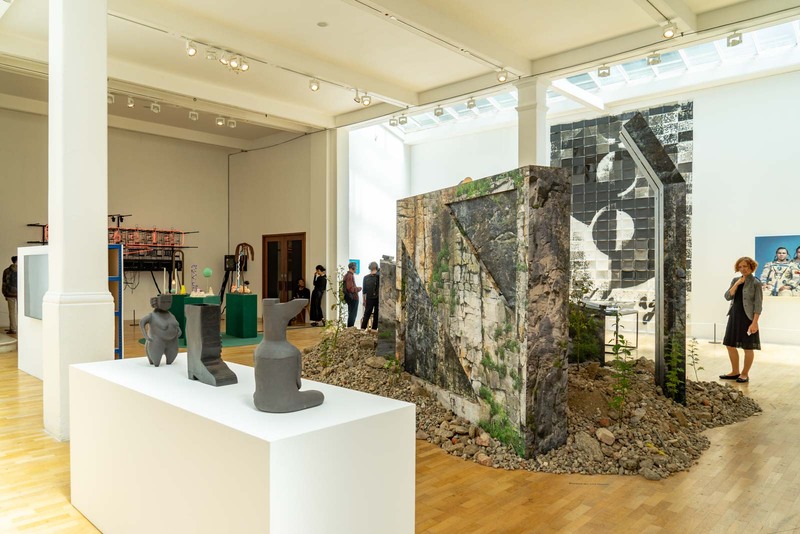 Let’s start with one of the best things in the area – the Whitechapel Gallery. It was opened as a public gallery in 1901 and has been going strong ever since. Even though it still has a local focus, it is one of London’s most important cultural institutions. The gallery has quite a few rooms over several floors and it uses them to show a variety of exhibitions. What I love about it so much is that it encourages local artists and artists from disadvantaged backgrounds – but also has some big names on display sometimes. Entry to the Whitechapel Gallery is free and it’s easy to spend an hour or so here. Of course, Whitechapel has more art than just what’s on display in the gallery. The whole suburb has become an exhibition, with street art all throughout the area. What started as an underground movement has moved into the mainstream, with some of the world’s biggest street artists displayed here. It’s easy to find a lot of the art without any directions. 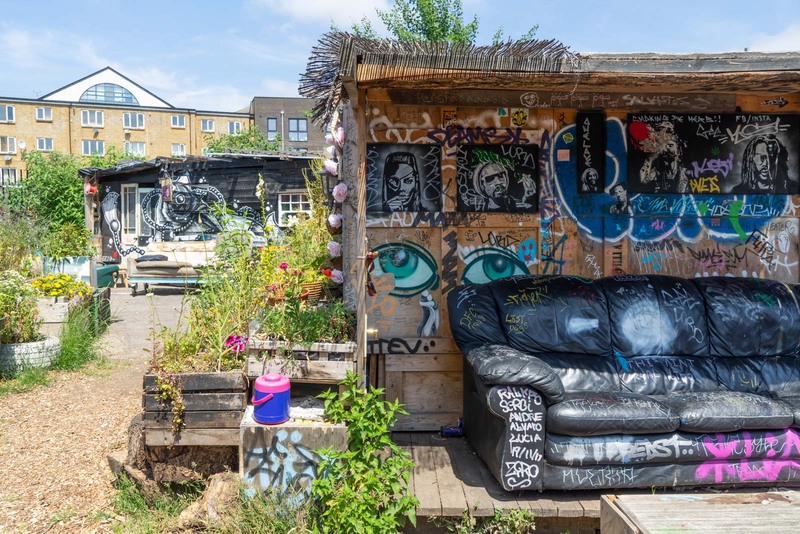 Just explore all of the side streets off Brick Lane, have a look around the Nomadic Community Garden, and also check out the streets around Village Underground. 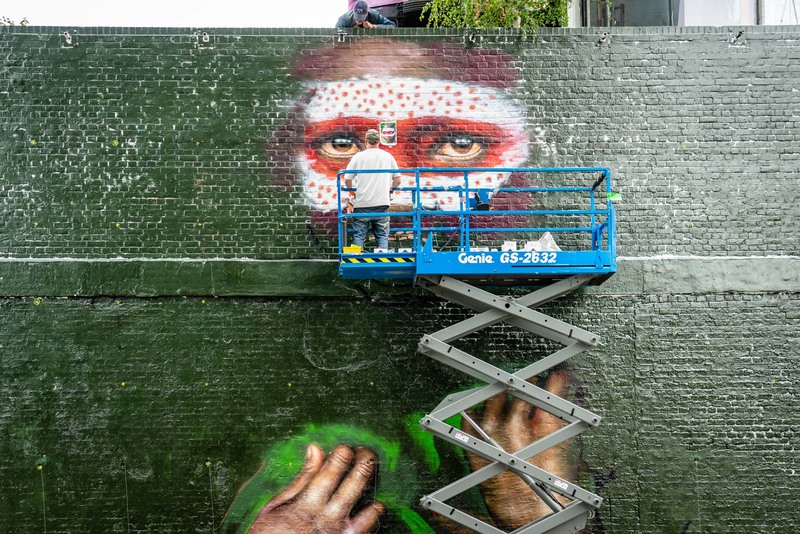 As well as street art, you’re going to find street food in Whitechapel. Remember the immigrants in the East End I mentioned earlier? Well, those original newcomers have left their mark in this part of London and it’s one of the most multicultural areas you’ll find in the city. 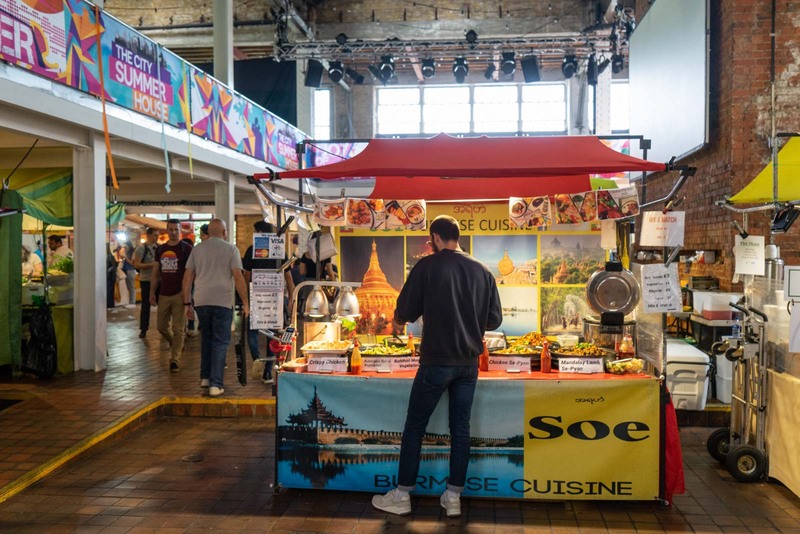 There are a few places in Whitechapel that offer a great selection of ethnic street food – particularly on the weekends or when there are special market events. The best advice I can give is to head to Brick Lane, where you’ll find various stalls depending on the day and time of year. But I think the best place to head to is the Brick Lane Food Hall, which is open every Saturday and Sunday. There are more than a dozen different cuisines at the Brick Lane Food Hall to choose from – and you’ll get a huge feed for a low price. 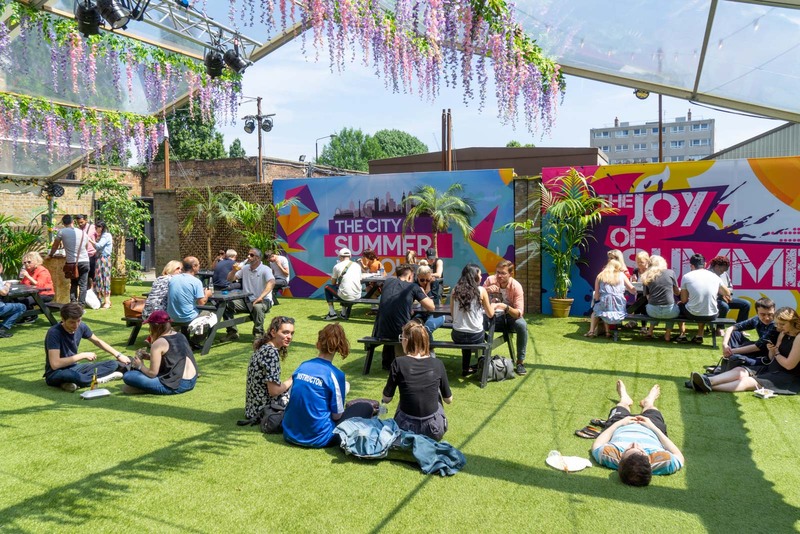 Plus, in the warmer months, there’s an outside area with a bar! The most famous cuisine in Whitechapel, that deserves a special mention, is the Indian food. Walking along Brick Lane, you’ll notice that there’s a huge amount of Indian restaurants, each with a sign claiming to have been named the best in a particular year. You’ll get some great lunch deals at most of the restaurants and, at night, the whole area will be busy. It’s definitely a typical Whitechapel experience to have a meal at one of these places. I would love to be able to recommend specific restaurants but it’s not that simple because things change a fair bit. But two of the consistently high-rated options are Brick Lane Brasserie and City Spice. 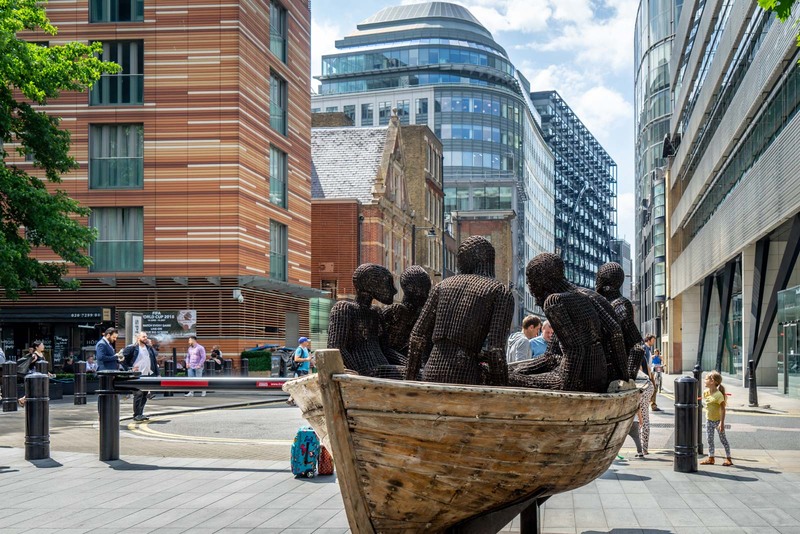 I’ve usually always thought of the area around Whitechapel as a good place to get authentic meals from a whole range of cultures – but in recent years it has also become home to some fantastic modern British restaurants. 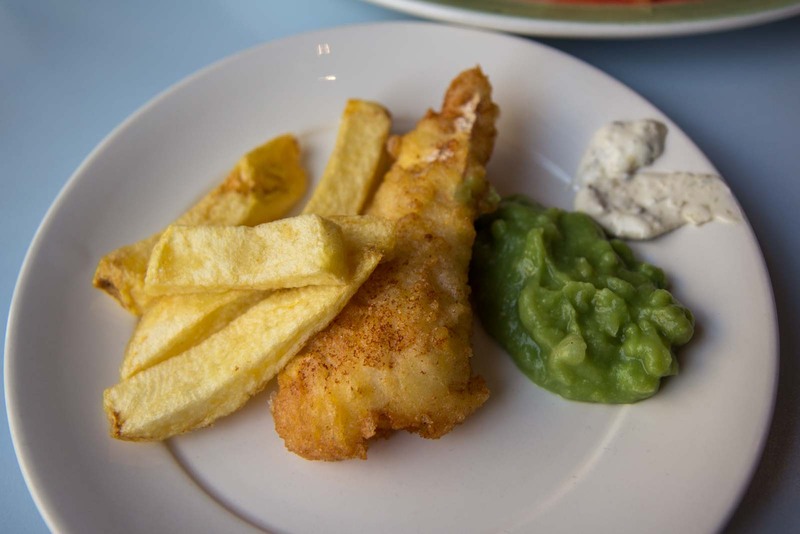 Places like The Culpeper, Poppies Fish and Chips, and St John Bread and Wine are some of the best places to eat in Whitechapel. But there are plenty more because this has become a very popular part of London for a night out. Let’s not think too much about food when I mention the next place – Spitalfields Farm. 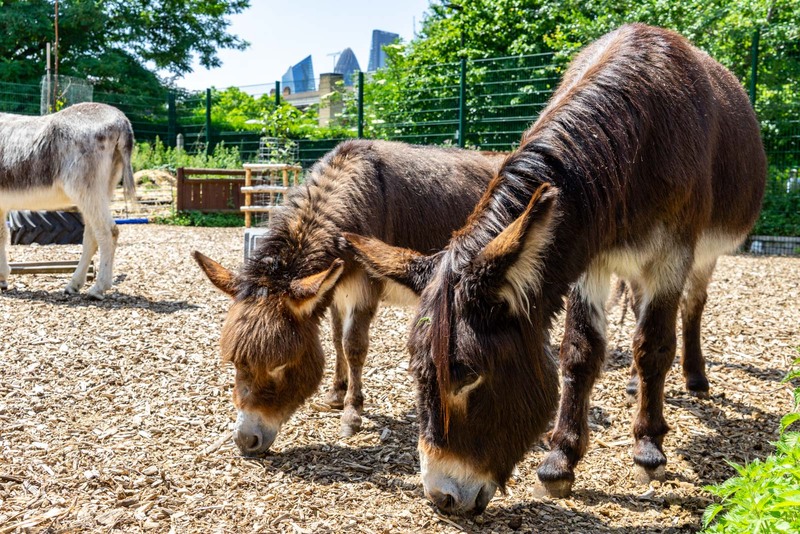 This is not what you would expect to find in the middle of the city but Spitalfields Farm is a breath of fresh air. The farm was started in 1978 and these days it has plots growing crops and a whole heap of animals. It’s free to go in and you can see (and maybe pat) the animals and speak to some of the volunteers who help out here. Quite often, on the weekends, there are demonstrations going on. I think kids will particularly love this place but, even as an adult, I really enjoy popping in. The donkeys are my favourites. 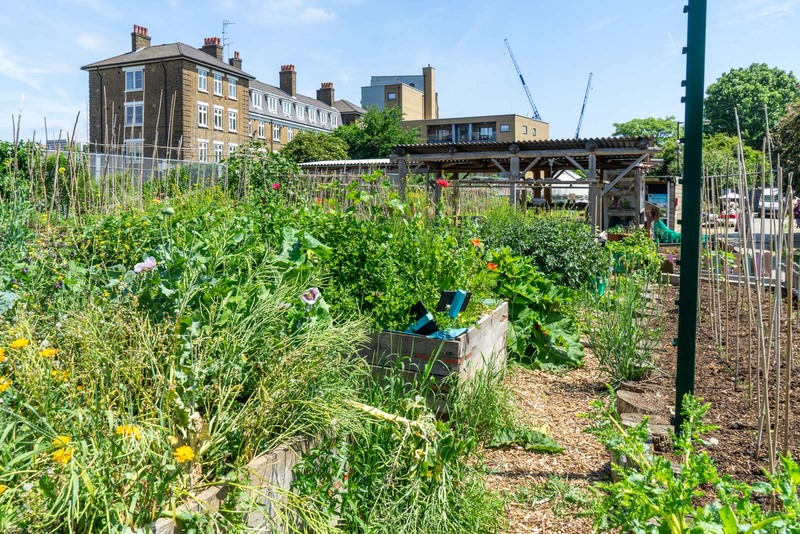 For a different kind of garden, it’s also worth visiting the Nomadic Community Garden, just on the other side of the Overground track. This one is aimed more at adults, although the kids will enjoy it too. 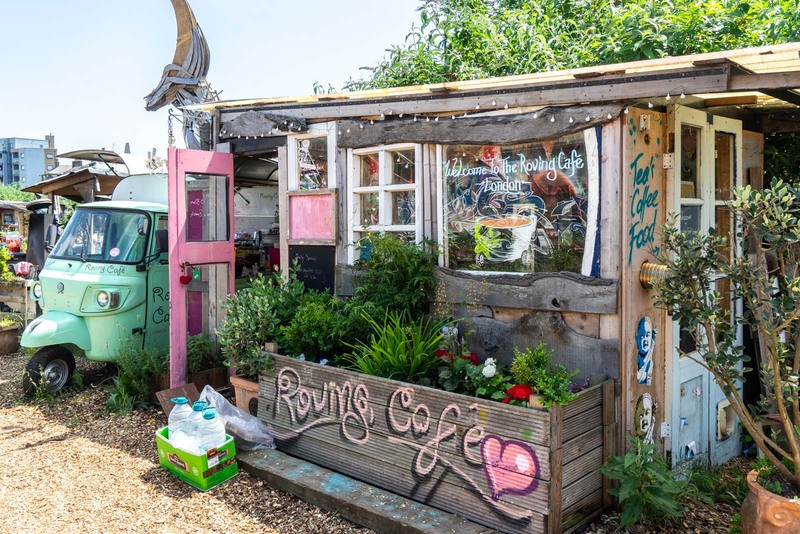 The Nomadic Community Garden is an organic community where the members have made different spaces out of things they have found, creating a peaceful and colourful environment. It sometimes feels like an art gallery, sometimes like a farm, sometimes like a cafe, and sometimes like a performance space. Which is not a surprise – seeing as all of those things happen here. It’s free to pop in and you’re welcome to just have a look around. But you may also like to have a rest, grab something to drink, and meet some of the people who have helped create the space. 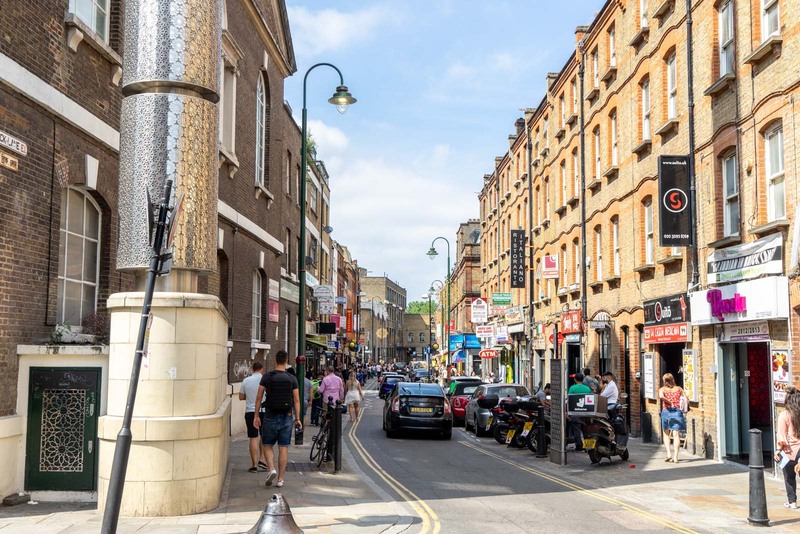 If you’re interested in shopping, then you’re going to love what you’ll find around Whitechapel. There aren’t many of the normal high street chains here – you’re much more likely to find boutique and vintage clothes shops. To check out the best boutiques and vintage shops in Whitechapel, I would suggest starting at the Old Truman Brewery, which has been converted into a space with some good shopfronts. From there, many of the best vintage shops are within a block or so. Most of them are open all week but you’ll find special pop-up markets on the weekend as well. 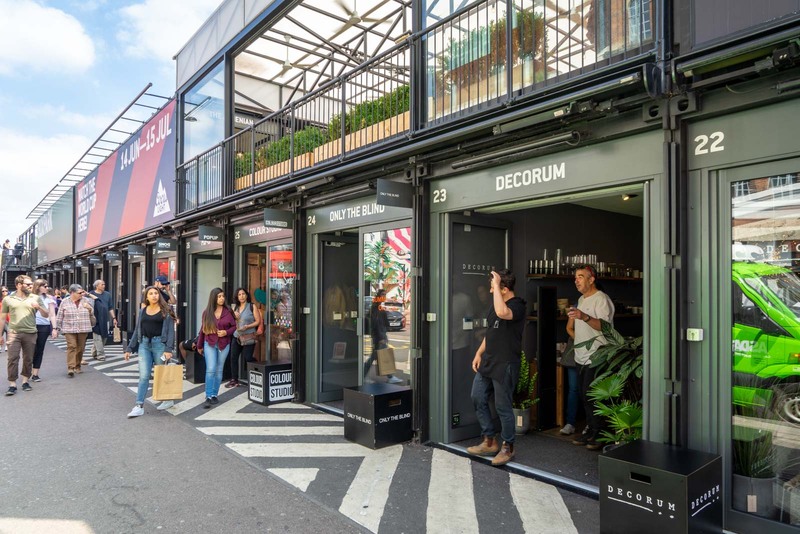 Speaking of pop-up markets, it is well worth checking out BoxPark. It’s on the edge of Whitechapel and Shoreditch, where the hipsters and tech entrepreneurs meet. (I haven’t really included anything in this list that’s in the main part of Shoreditch – I think that can wait for a dedicated destination guide). The BoxPark opened in 2011 and is a small shopping centre made out of refitted shipping containers. On the ground level, along the street, each of the containers has a different shop inside and they change quite regularly. The upper level now has bars and restaurants and is a good place to stop for a drink. 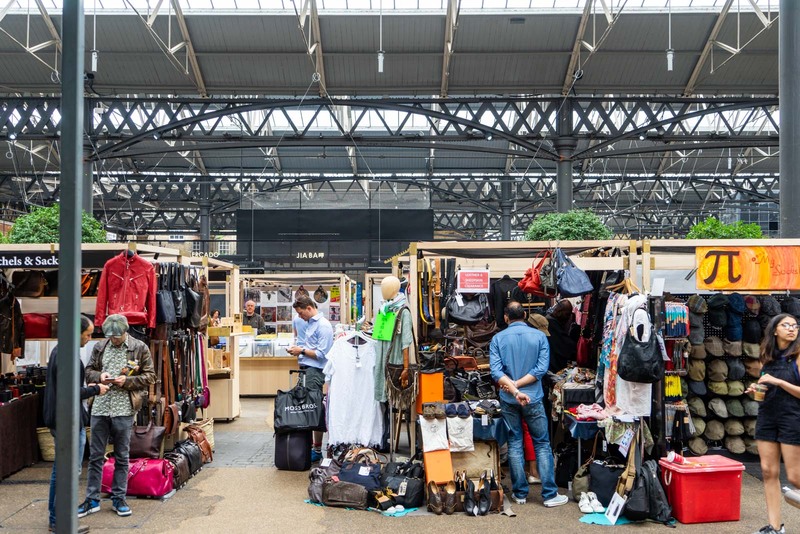 Another great place for shopping – and even just to have a look – is the Old Spitalfields Market. There has been a market on this space for more than 350 years, since 1638 when King Charles allowed it in what was then a rural area. The oldest buildings that you’ll find here today are from 1887 but there are also more modern extensions and renovations. Inside the large complex are almost 50 shops and stalls, with a focus on small producers and local artisans. There are also more than 40 food and drink options and it’s a particularly popular spot for lunch. 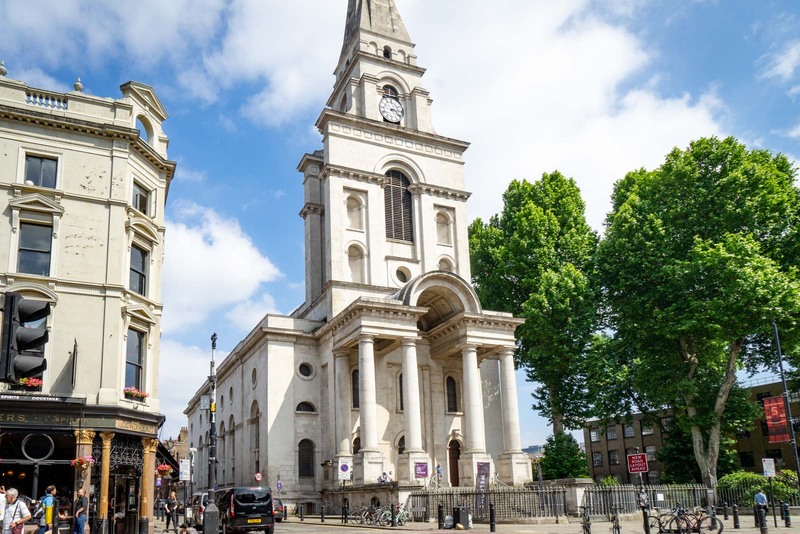 Across the road from the Old Spitalfields Market is one of the most striking churches in East London – Christ Church, Spitalfields. 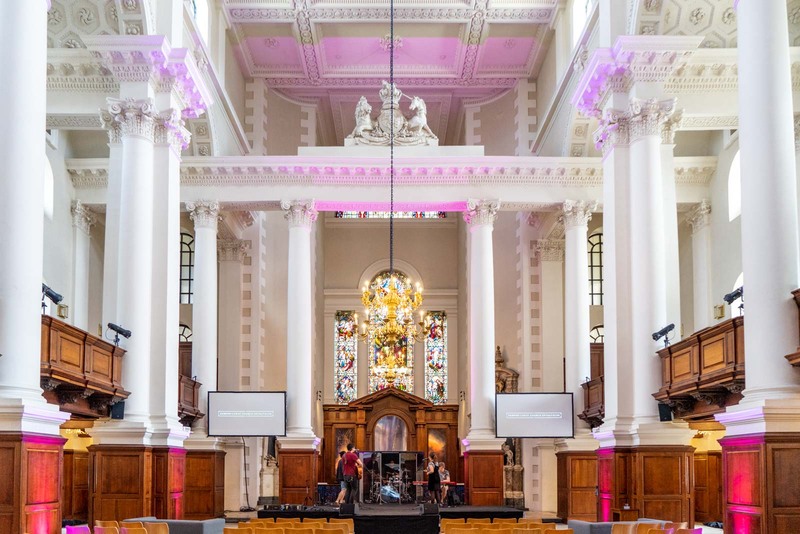 It was built between 1714 and 1729, and was intended to be a grand Anglican statement in a part of London that didn’t have a loyal Church of England following. It dominates the area today, so you can only imagine how it looked 300 years ago! I would suggest you take a moment to have a look inside because it’s a rather pretty building. The highlight, though, is the organ. It was added in 1735 and was the largest organ in England at the time – a title it kept for more than a century! 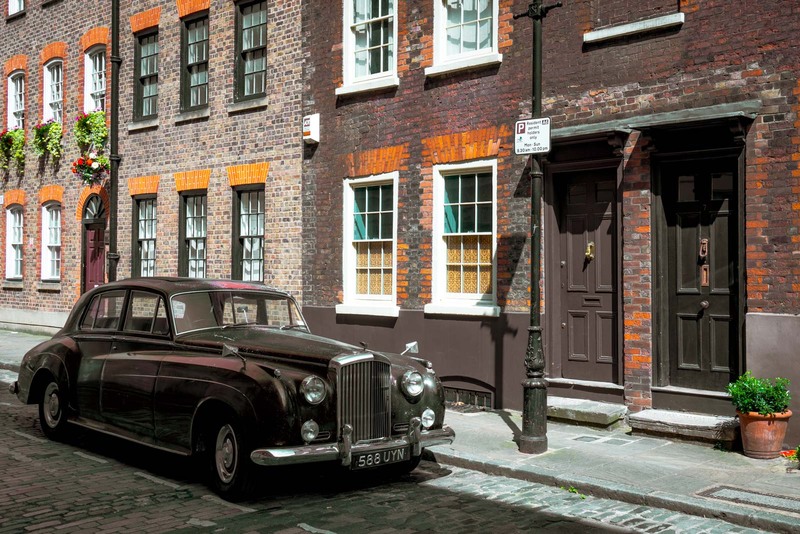 You’ll find one of London’s most interesting small museums here in Whitechapel. It’s in an old Georgian terrace and it’s called Dennis Severs’ House because in the 20 years he lived here, between 1979 and 1999, he turned it into a time capsule. In each room of the house, a different time period has been recreated, showing what it would have been like to live in this part of London at that time. He used a style called “still life drama”, which is supposed to make it feel as though the occupants have just walked out of the room. The museum isn’t open every day so be sure to check before you go. The entrance fee is £10, which is quite high, but it’s certainly an unusual experience. 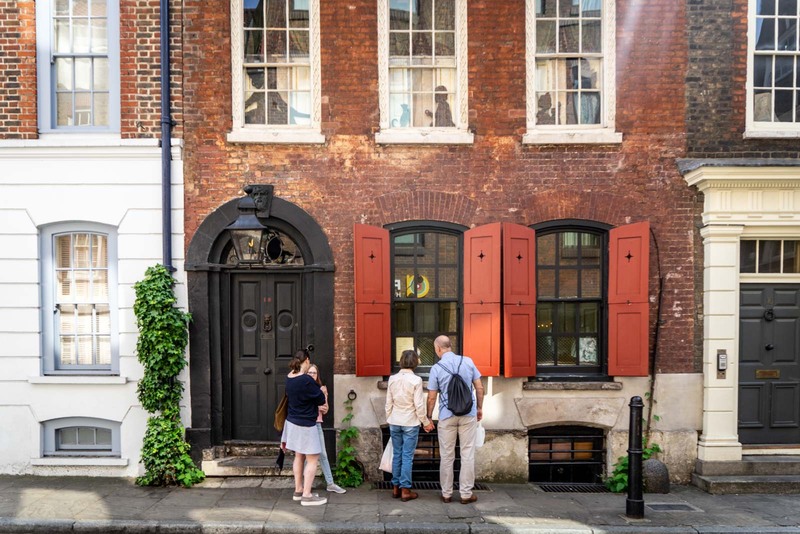 In the blocks around Dennis Severs’ House, you’ll see some traditional East End architecture… perhaps the kind of house that Jack the Ripper lived in? It was here in Whitechapel that Jack the Ripper killed his victims in the late 1880s. He was never found and the mystery about his identity and his motives still interest people more than a century after he claimed his last victim. I hope all of this gives you some great ideas of what to do around Whitechapel, especially if you’re staying at the wombat’s hostel here. London is a big city and it’s easy to get lost when it comes to sightseeing. I think there’s something quite nice about focusing on just a small area – and Whitechapel has more than its share of history. 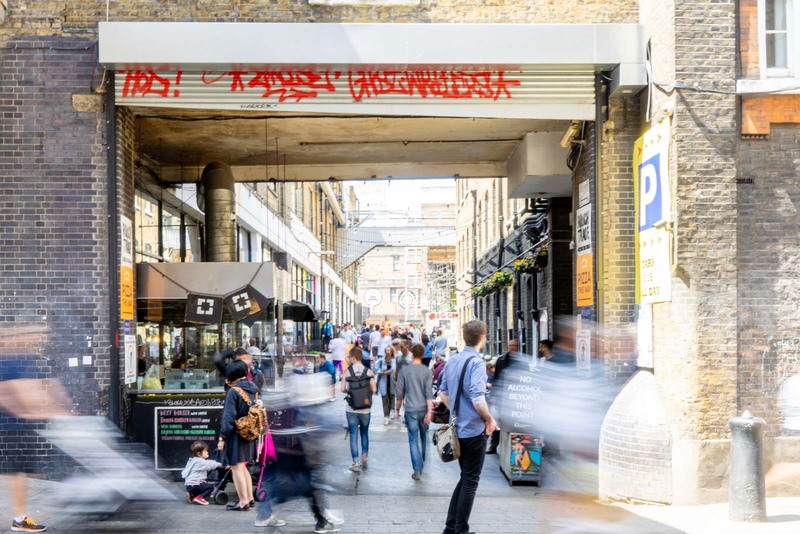 If you have any other suggestions for things to do in Whitechapel, please let everyone know in the comments section below. I visited Whitechapel ages ago for a Jack the Ripper tour. There was not street art around then, nor were there any other artsy places. It looks like a fun area to visit nowadays, I should really make my way back there one day! such an interesting and helpful post you have created here, thank you for all the great ideas! There are so many things to do there in your list. Loved your pictures. Thank you so much for sharing this post and experiences. Such a great idea and informative post.. It look like incredible place to visit and you captured awesome pictures. Thanks a lot to share this information!! A friend told me about this place months ago. I’m visiting London in a few weeks and I’ve been trying to remember this place that he was telling me about. I also heard that Shoreditch was a must visit aside from Whitechapel! Wow! this is so informative. Thanks for sharing. Nice read. Loved it. Cheers!